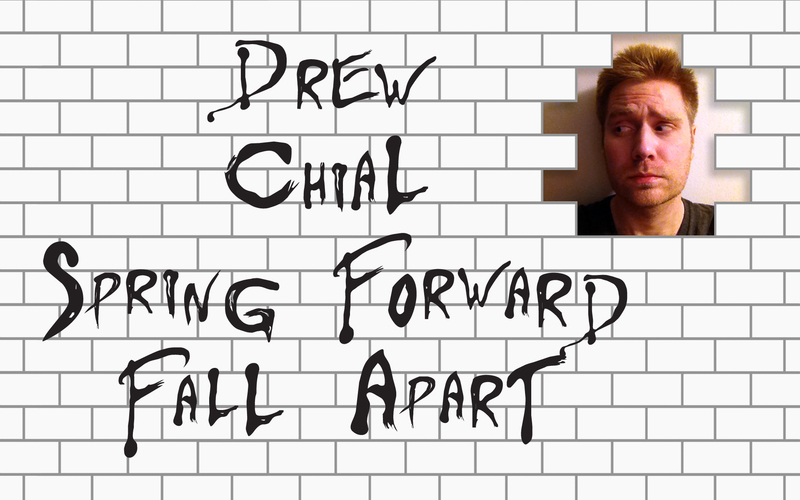 When cabin fever strikes, we all get to reenact Pink Floyd’s The Wall, here’s something I wrote about it. I wrote this poem just as the leaves started to turn, and slowly but surly it became a self fulfilling prophecy. The cold has gotten so harsh that my dog refuses to step on the sidewalk for fear that the ice will chill her paws. The clouds overhead have become a fixture. The stars won’t be back until May. The monochrome landscape isn’t as inspiring as it was a few months ago. Anything worth describing has been buried beneath a layer of white out. There’s a city to explore, but subzero temperatures have a way of narrowing my field of vision. My introversion has gone from a choice, to something that’s necessary for my survival. If I wander the streets too long, I’ll die of exposure. So here I am at home surrounded by a wall of screens. I’ve got a season of House of Cards to watch. I’ve got a crackling electric heater. I’ve got a fridge full of left overs, and a dog demanding that I feed her. I’m comfortably numb, zoning out on the internet, wondering if there’s anybody out there. You wake up in a room with no idea how you got there. There are clues, but your mind struggles to piece itself together. Who are you? Where is this? Why are you here? This audio short is an account of my own experience with amnesia. It’s by far the best audio short I’ve ever posted. I wanted to blur the line between the atmosphere and the music. I’ve taken foley FX and created a soundscape. It’s a living breathing hospital. Doctors swarm. Elevators ding. Sirens blare. A heart rate monitor keeps the time. My heart is the beat. The music compliments the story. It’s haunting, hypnotizing, and soothing. Textured strings tumble over gentle piano. The melody builds as the revelations bubble to the surface. The instrumental version would make fine music to inspire your writing.